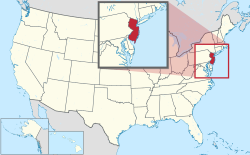 New Jersey is one of the 50 states of the United States of America. It is in the northeastern section of the country along the coast of the Atlantic Ocean. It is a small state, shaped like a letter [S], and bordered on the west by Pennsylvania and Delaware across the Delaware River, on the north by New York, on the northeast by the Hudson River and New York City, on the east and southeast by the Atlantic Ocean, and on the southwest by Delaware Bay. The capital of New Jersey is Trenton and the largest city is Newark, though New Jersey is better known for bordering the large cities of New York City and Philadelphia. 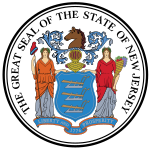 The state nickname is "The Garden State". The current governor is Phil Murphy. New Jersey is the fourth smallest state, but has the eleventh highest number of people. It therefore has the highest population density (number of people for the amount of land) in the United States. New Jersey is also well known for its beaches, industries, swamps, and pine forests. The climate is hot and humid summers and cold winters, with about 1200 mm of precipitation every year. The average temperature in July is 25-30 degrees Celsius and in January around freezing point. Before Europeans came, the land that is now New Jersey was inhabited by the Lenape (also known as Delaware Indians by the English), who were nomads, hunters, and farmers. The Dutch came to the northern area of the state in the 1630s, after Henry Hudson explored the area, thought it was a nice place, and claimed it for the Dutch. Towns quickly sprang up, occupied by the Dutch, Swedes, and Finns. People rushed in. The first towns, such as Bergen (now Jersey City), Trenton (the capitol), and Burlington developed. Many others started themselves upon the west bank of the Hudson. New Jersey was part of the area known at this time as New Netherland. In 1664, the English took New Netherland from the Dutch and added it to their colonies. This part was renamed New Jersey after an island in the English Channel known as Jersey. New Jersey took part in the American Revolutionary War, and was a scene of battles. On Christmas in 1776, George Washington's army entered New Jersey to attack British soldiers at Trenton and Princeton. The American army won, in two small but famous battles that were important in boosting American morale. Later, the rebels drove the British residents out of Princeton and for a time established a national capital there. New Jersey would be the third state to join the United States of America and the first to approve the Bill of Rights. New Jersey has 21 counties. Wikimedia Commons has media related to New Jersey. ↑ The Garden State and Other New Jersey State Nicknames, Robert Lupp, New Jersey Reference Services, New Jersey State Library, October 12, 1994. ↑ "Language spoken at home by ability to speak English for the population 5 years and over – 2014 American Community Survey 1-Year Estimates". Retrieved February 10, 2016. ↑ "GPO Style Manual 2008" (PDF). Retrieved July 25, 2010. ↑ "New Jersey – Definition and More from the Free Merriam-Webster Dictionary". Merriam-Webster. Retrieved June 3, 2013. ↑ "Definition of New Jerseyite". Dictionary.reference.com. Retrieved July 25, 2010. ↑ "New Jersey Population 2018". World Population Review. World Population Review. Retrieved May 6, 2018. ↑ 8.0 8.1 "Elevations and Distances in the United States". United States Geological Survey. 2001. Archived from the original on October 15, 2011. Retrieved October 24, 2011. ↑ "New Jersey State Bird". The Official Web Site for The State of New Jersey. The State of New Jersey. Retrieved June 5, 2013. ↑ "The New Jersey State Fish". The Official Web Site for The State of New Jersey. The State of New Jersey. Retrieved June 5, 2013. ↑ "New Jersey State Flower". The Official Web Site for The State of New Jersey. The State of New Jersey. Retrieved June 5, 2013. ↑ "New Jersey State Bug". The Official Web Site for The State of New Jersey. The State of New Jersey. Retrieved June 5, 2013. ↑ "New Jersey State Animal". The Official Web Site for The State of New Jersey. The State of New Jersey. Retrieved June 5, 2013. ↑ 15.0 15.1 "The New Jersey State Trees". The Official Web Site for The State of New Jersey. The State of New Jersey. Retrieved June 5, 2013. ↑ "New Jersey's State Dance". The Official Web Site for The State of New Jersey. The State of New Jersey. Retrieved June 5, 2013. ↑ "New Jersey's State Fruit". The Official Web Site for The State of New Jersey. The State of New Jersey. Retrieved June 5, 2013. ↑ Levins, Hoag. "Hadrosaurus foulkii Becomes Official State Dinosaur, June, 1991". Retrieved June 5, 2013. ↑ "New Jersey State Soil – Downer". Natural Resources Conservation Service. United States Department of Agriculture. Retrieved August 17, 2014. ↑ DeFalco, Beth. "NJ gov off to a strong start; some say too strong". Retrieved March 24, 2010. ↑ 21.0 21.1 21.2 21.3 "NACo - Find a county". National Association of Counties. Retrieved January 25, 2008. ↑ "New Jersey Formation Maps". Genealogy, Inc. Retrieved January 25, 2008. ↑ "The Origin of New Jersey Place Names" (PDF). New Jersey State Library Commission. Federal Writers' Program. 1938. Retrieved April 25, 2008. ↑ Greenberg, Gail. A Brief History of Camden County, Camden County, New Jersey. Accessed June 26, 2007. 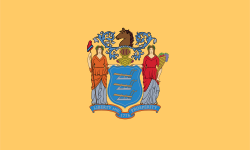 ↑ Mercer County History, State of New Jersey. Accessed June 26, 2007. ↑ The Land Past and Present, Retrieved on March 22, 2007. This page was last changed on 12 April 2019, at 15:40.